Most red algae are marine and benthic, although ~150 are reported in freshwater habitats, mainly in streams or rivers. Sheath (2003) lists 25 species of Batrachospermum, some of these the most widespread freshwater reds in North America. The unicellular thermophile Cyanidium caldarum inhabitats hot springs, and is considered to be a red (Broadwater and Scott 1994). Other groups of reds in PhycoKey or the microscopic reds, the crustose reds, and the macroscopic reds (centimeters to meters tall). Rhodophyceae include an estimated 4,000 to 6,000 species (Norton et al. 1996), but see further estimate below. Most red algae (97%) are marine and benthic, although ~150 are reported in freshwater habitats, mainly in streams or rivers. Sheath (2003) lists 25 species of Batrachospermum, some of these the most widespread freshwater reds in North America. The unicellular thermophile Cyanidium caldarum inhabitats hot springs, and is considered to be a red (Broadwater and Scott 1994). A recent review of classification of red algal genera includes 32 orders and 90 families of reds (Schneider and Wynne 2007). The authors classify reds as ‘Plantae’ instead of ‘Protista’, and they include molecular reclassification since Kylin’s previous review. Their list of orders and familes is alphabetic rather than phylogenetic. The estimate of numbers of accepted species descriptions varies from 4,000 to 10,000 and a considered total is 6,500 (Guiry 2007 online). Along with Glaucophyceae and Chlorophyceae, the Rhodophyceae are considered Archaeoplastids – incorporating by endobiosis a cyanobacterial cell. All other photosynthetic eucaryotes have had serial endosymbiosis. Primary photosynthetic pigments include Chl a and the phycobilins phycocyanin and phycoerithrin, all inherited from a cyanobacterium. Several species are encrusted with calcite (calcium carbonate) and are important reef builders in tropical marine habitats. Life cycles of reds are either mainly biphasic (Bangiophyceae) or mainly triphasic (Florideophyceae) with an extra diploid stage. Pit connections and plugs are characteristic of the more advanced Florideophyceae (Dawes and Mathieson 2008). Human consumption of red ‘sea vegetables’ includes > 300 species (Ibid. 2008). 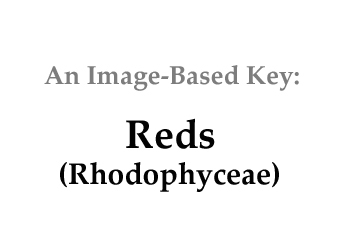 In PhycoKey the reds are simplified into morphotypes from microscopic to crustose to foliose macroreds, and is far from encyclopedic coverage of Schneider and Wynne (2007). Broadwater, S.T., and J.L. Scott 1994. Ultrastructurer of unicellular red algae. In: Evolutionary Pathways and Enigmatic Algae: Cyanidium caldarum (Rhodophyta) and Related Cells. J. Sechbach (Ed.) Kluwer Academic Publishers, Boston, MA.(pp. 215-230). Dawes, C.J., and A.C. Mathieson 2008. The Seaweeds of Florida. University Press of Florida (592 pp.). Norton, T.Al, M. Melkonian and R.A. Andersen 1996. Algal biodiversity. Phycologia 35:408-325. Schneider, C.W., and M.J. Wynne 2007. A synoptic review of the classification of red algal genera a half century after Kylin[s “Die Gattungen der Rhodophyceen”. Botanica Marina 50:197-249. Sheath, R.G. 2003. Red Algae. In: Freshwater Algae of North America (Chapter 5). Wehr, J.D. and R.G. Sheath (editors). Academic Press. Taylor, W.R. 1966. Marine Algae of the Northeastern Coast of North America. Univ. of Michigan Press, 3rd printing. (509 pp).